1. Irina Nagornykh et al. article headlined "Mikhail Fedotov Picks Up Groups of 3" says that the Kremlin has decided that top three leaders in the online voting held in early autumn will enter the president's human rights council; pp 1, 3 (1,012 words). 2. Pyotr Rudenko and Tatyana Grishina article headlined "Federal Service for Financial Markets Merges Licenses" says that the Federal Service for Financial Markets has begun to reform its central office: the license units in three departments of the agency will be merged; pp 1, 10 (548 words). 3. Ilya Safronov et al. article headlined "With Shoulder Straps and Suitcase" describes the first working day of the newly appointed Defense Minister Sergei Shoigu; pp 1-2 (753 words). 4. Kirill Belyaninov and Sergei Strokan article headlined "Barack Obama Manages to Reset Himself" says that Democrat Barack Obama has won the Nov. 6 presidential election in the U.S.A.; features U.S. experts' comments on the issue and contemplates the future of Russian-U.S. relations; pp 1, 8 (964 words). 5. Sofya Samokhina article headlined "Special Fraud Envisaged for Businessmen" says that new amendments to the Russian Criminal Code article on fraud envisage including fraud in the entrepreneurial sector into separate proceedings and banning law enforcers from initiating criminal proceedings against businessmen without a complaint from the injured party; p 2 (545 words). 6. Natalya Bashlykova et al. article headlined "Former Itar-Tass General Director to Work in Federation Council for Kuban" says that former Itar-Tass general director Vitaly Ignatenko will represent the Krasnodar region in the Federation Council. Patriots of Russia member Igor Morozov will be given an A Just Russia activist's seat in the Ryazan City Duma and will represent the Ryazan region in the upper chamber of the parliament; p 2 (608 words). 7. Anna Pushkarskaya et al. article headlined "Moscow Region to Finish Sergei Shoigu's Projects" looks at the first meeting of the Moscow region government after the region's head Sergei Shoigu moved to the defense minister post; p 2 (654 words). 8. Dina Polina and Anna Pushkarskaya article headlined "'Where Did You Master Being Sly, I Did Not Teach You This'" gives an account of a video link held by President Vladimir Putin to discuss modernization of education in Russia; p 2 (685 words). 9. Oleg Kashin and Ilya Shepelin article headlined "Reds Go on Green Light" says that the Nov. 7 rally held in Moscow by the Communist Party of the Russian Federation on the occasion of the 95th anniversary of the 1917 October revolution has attracted a record small number of participants; p 3 (530 words). 10. 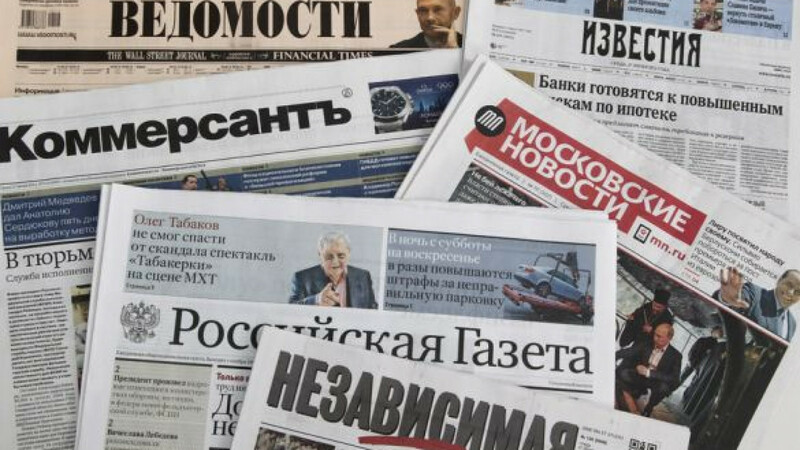 Maxim Ivanov article headlined "People Look Closely at Politics" says that a public opinion poll conducted by the Levada Center has shown that 28 percent of Russians are ready for active political activities, which is by six per cent more than in June; p 3 (364 words). 11. Igor Lesovskikh and Nikolai Sergeyev article headlined "Accusing Materials Found for Ura.ru" says that the chief editor of the Yekaterinburg-based news agency Ura.ru, Aksana Panova, has been charged with extorting 3 million rubles ($96,780) from a businessman for not publishing critical articles about him; p 3 (572 words). 12. Sergei Mashkin article headlined "Anatoly Serdyukov May Be Not Only Witness" says that Yekaterina Smetanova and Maxim Zakutailo, who are involved in the illegal dealings with military property, will be officially charged with fraud. The results of their questioning and other investigative actions will determine former Defense Minister Anatoly Serdyukov's status in the case; p 5 (747 words). 13. Pyotr Netreba article headlined "Sea of Russian-Vietnamese Friendship" sums up the results of talks between Prime Minister Dmitry Medvedev and his Vietnamese counterpart in Hanoi; p 6 (835 words). 14. Tatyana Yedovina article headlined "EBRD Stakes on Integration Instead of Oil" looks at research conducted by experts from the European Bank for Reconstruction and Development (EBRD) regarding the economic situation in Russia and prospects for its development; p 6 (501 words). 15. Pavel Tarasenko piece headlined "U.K. Unites Syrian Opposition" says that the U.K. has stepped up efforts to unite separated opposition groups fighting against Syrian President Bashar Assad's regime. In the near future, London will begin to establish contacts with opposition field commanders and increase its humanitarian aid to Syrian refugees; p 7 (397 words). 16. Alexander Gabuyev article headlined "Constrained With One Congress" looks ahead at the 18th congress of the Chinese Communist Party, which opens today and at which the Chinese leadership will be reshuffled; p 7 (764 words). 17. Boris Makarenko report published in the regular opinion column headlined "Price of Issue" looks at Barack Obama and lists three reasons for his victory in the Nov. 6 presidential election; p 8 (375 words). 18. Yelena Chernenko and Pavel Tarasenko article headlined "Russia Chooses Head of State Department" says that John Kerry, the chairman of the U.S. Senate foreign relations committee, and Susan Rice, the U.S. permanent representative to the UN, are considered to be the most probable successors to U.S. Secretary of State Hillary Clinton. Kerry is a more preferable candidate for Moscow, the article says; p 8 (728 words). 19. Kirill Melnikov piece headlined "LUKoil Strengthens African Bloc" says that the Russian oil company LUKoil has acquired a 25 percent stake in a project to develop the shelf of Sierra Leone; p 11 (383 words). 20. Sergei Sobolev report "STS Media Gets Digit" says that all the three TV channels of the holding company STS Media will take part in the contest for presence in the second multiplex; p 13 (600 words). 1. Ivan Rodin and Alexandra Samarina article headlined "Business Demands Amending Criminal Code" looks at State Duma hearings of amendments to the Russian Criminal Code article on fraud in the entrepreneurial sector; pp 1, 3 (902 words). 2. Maria Bondarenko article headlined "Nogais Begin to Speak About Autonomy" says that the Nogais people, mostly living in Dagestan, Chechnya and the Stavropol region, have sent a letter to President Vladimir Putin, asking him to consider establishing an autonomous federation of the Nogais in the North Caucasus; pp 1-2 (515 words). 3. Viktor Myasnikov article headlined "Glonass Money Arouses Interest of Public Sector Heavyweights" says that searches have been held in the office of the company, through which 2 billion rubles ($64.5 million) from the money allocated to develop the Glonass navigation systems, has been stolen. The issue may cost Federal Space Agency head Vladimir Popovkin his post; pp 1-2 (891 words). 4. Tatyana Ivzhenko article headlined "Ukraine Enters Period of Troubles" says that the Ukrainian opposition has demanded that the Central Elections Commission should claim responsibility for the parliamentary election results in 13 districts, where opposition candidates have won, but the victory was given to ruling party nominees. Otherwise, opposition parties will demand that new parliamentary elections be held; pp 1, 6 (965 words). 5. Artur Blinov and Yury Paniyev headlined "Red States Plus Blue States Equals United States" says that Democrat Barack Obama has won the presidential election; however, the political landscape in the U.S. Congress has not changed; pp 1, 7 (1,649 words). 6. Nikolai Surkov article headlined "Assad Advised to Flee Syria" says that British Prime Minister David Cameron has called on the U.S.A. and its allies to make additional efforts to unite the Syrian opposition to help it overthrow Bashar Assad's regime. Cameron also suggested giving Assad a chance to leave the country; pp 1, 7 (505 words). 7. Editorial headlined "Ice Does Not Begin to Break, But Melts" contemplates Russian-Georgian relations and prospects for their development after the opposition has won the parliamentary election; p 2 (539 words). 8. Alexei Gorbachev article headlined "Emergency Electoral Assistance" says that the Russian opposition has offered all monitoring agencies to set up a single coordination centre similar to the U.S. emergency service; p 3 (610 words). 9. Leonid Radzikhovsky article headlined "With One Shot" says that the dismissal of Defense Minister Anatoly Serdyukov is interesting from a political point of view as it reveals Putin's new political style; p 3 (730 words). 10. Sergei Kulikov article headlined "Poland Waits for More Money From Gazprom" says that Poland has announced that it is ready to admit Russian gas giant Gazprom to its electric energy market. Experts warn that the move may turn out to be a prelude to talks on new abatements; p 4 (609 words). 11. Sergei Nikanorov article headlined "Minister of 'Strange' Affairs" criticizes Far East Development Minister Viktor Ishayev for his performance on the post as implementation practice and financial discipline in the Far Eastern Federal District leave much to be desired; p 5 (1,296 words). 12. Grigory Mikhailov article headlined "Bishkek Waits for Parcel From Moscow" says that Russia is said to deliver military hardware to Kyrgyzstan and Tajikistan. Bishkek welcomed the news, though some people say that thus the country will turn into Russia's adjunct; p 6 (662 words). 13. Vladimir Skosyrev article headlined "Chinese Communist Party to Dismantle Mao Zedong's Cult" says that the 18th congress of the Chinese Communist Party opens today. The main question is whether the status of Chinese ideological leader Mao Zedong will be preserved; p 7 (574 words). 1. Yekaterina Kravchenko and Yevgenia Pismennaya article headlined "Germany Yields" says that the German economy is going into recession; pp 1, 3 (819 words). 2. Vladimir Shtanov article headlined "Excluded From List" says that the list of car producers exempted from the car recycling tax has been surprisingly halved. The Industry and Trade Ministry has promised to examine the issue; pp 1, 8 (619 words). 3. Olga Plotonova article headlined "Credit Quarter" says that research has shown that Russian banks satisfy only one in four mortgage or car loan applications due to Russian people's great debt load; p 1 (499 words). 4. Editorial headlined "Moscow Region Without Shoigu" contemplates the future of the Moscow region after its governor Sergei Shoigu moved to the defense minister post; pp 1, 4 (531 words). 5. Alexei Nikolsky and Natalya Kostenko piece headlined "Shoigu's Army" looks at personnel and organizational decisions expected to be made by new Defense Minister Sergei Shoigu; p 2 (355 words). 6. Anastasia Kornya article headlined "They Do Not Want to Become Agents" says that the Russian branch of the international human rights organization Transparency International has refused to observe the law on foreign agents and plans to complain to the Constitutional Court if sanctions are imposed against it; p 2 (320 words). 7. Maxim Tovkailo article headlined "Without Duties to Vietnam" says that the setting up of a free trade zone between Vietnam and the Customs Union of Russia, Belarus and Kazakhstan has become one of the results of the talks between the Russian and Vietnamese prime ministers in Hanoi; p 3 (379 words). 8. Anton Trifonov and Irina Kezik article headlined "To Reach Top 10" says that the Russian oil company Rosneft's decision to buy the Russian-British joint venture TNK-BP has raised the company's price, thus bringing Rosneft nearer the top 10 of the most expensive oil and gas companies in the world; p 8 (490 words). 9. Kirill Titayev article headlined "Minor Affairs in Interior Ministry" looks at changes in the policy of the Interior Ministry led by Vladimir Kolokoltsev; p 4 (607 words). 10. Vasily Kashin article headlined "New China: Comrade Chairman" focuses on the structure of the Chinese top leadership and contemplates whether incumbent Chinese leader Hu Jintao will manage to remain the chairman of the Central Military Commission (CMC); p 4 (767 words). 11. Ksenia Boletskaya article headlined "Two Seats of Derk Sauer" says that the Russian media group RBK will announce today the appointment of Derk Sauer, chairman of the supervisory board of the Sanoma Independent Media (SIM) publishing house, as president of RBK and, likely, the chairman of the RBK board of directors; p 10 (474 words). 12. Editorial headlined "Crisis for Obama" comments on Barack Obama's victory in the U.S. presidential election; p 4 (343 words). 13. Polina Khimshiashvili article headlined "Obama's Magic" looks at reasons for Barack Obama's victory in the Nov. 6 presidential election; p 2 (441 words). 1. Sergei Karaganov article headlined "Oba-ma!" welcomes Barack Obama's victory in the U.S. presidential election, contemplates the future of Russian-U.S. relations and features experts' comments on U.S. relations with Europe and Middle East countries; pp 1, 8 (645 words). 2. Yury Gavrilov article headlined "Cheaper for One's Own People" says that new instances of fraud have been revealed in the case of the Defense Ministry's company Oboronservis; pp 1-2 (573 words). 3. Vladimir Kuzmin article headlined "To Trade Freely" sums up the results of Medvedev's visit to Vietnam; p 3 (780 words). 4. Anna Zakatnova article headlined "Without Revolution" looks at how Russian opposition parties celebrated the 95th anniversary of the 1917 October revolution on Nov. 7; p 3 (550 words). 5. Natalya Kozlova article headlined "Complaint Behind Closed Doors" says that the Moscow City Court has dismissed a complaint challenging the arrest of opposition activist Leonid Razvozzhayev; p 7 (486 words). 6. Yakov Mirkin article headlined "About Price of Dollar and Oil" says that Barack Obama's victory in the presidential election may affect financial markets: the price on oil will begin to decline, whereas the dollar rate will remain unchanged or will rise slightly against all currencies except the yuan and the yen; p 8 (789 words). 7. Alexander Gasyuk article headlined "Russian Questions After U.S. Election" looks at the U.S. presidential election and dismissals in Obama's administration; p 8 (648 words). 8. Yevgeny Solovyev article headlined "Who Is Xi?" looks at Xi Jinping, who is expected to become the general secretary of the Chinese Communist Party and the Chinese president in March; p 11 (741 words). 9. Mikhail Gusman interview with Israeli President Shimon Peres, headlined "'I Prefer Prophet's Advice,'" who speaks about Russian-Israeli relations and his forthcoming visit to Russia; p 11 (2,094 words). 1. Tatyana Shirmanova article headlined "Program to Co-Finance Pensions to Be Abolished" says that the Russian government has decided not to extend the operations of the state program to co-finance pensions after Oct. 1, 2013, because it has failed; pp 1-2 (600 words). 2. Yelena Sharapova and Sergei Lebedev article headlined "Land for State Needs to Be Bought Twice as Quickly" says that the federal and municipal authorities will be able to buy plots of land for their infrastructure projects within a year, but not two, as now; pp 1, 4 (600 words). 3. Anastasia Dulenkova article headlined "Finance Ministry Does Not Rush a Rise in Tobacco Taxes" says that the Finance Ministry has suggested postponing a sharp rise in tobacco excise duties because it will only increase illegal tobacco sales; pp 1, 4 (500 words). 4. Alexandra Yermakova article headlined "State Support for Car Industry to Be Cut Threefold" says that budget spending on support of car producers will reduce from 60 billion rubles ($1.9 billion) to 45 billion rubles by 2020; pp 1, 4 (600 words). 5. Andranik Migranyan article headlined "Sandy Hurricane Wins Presidential Election Campaign in U.S.A." comments on Barack Obama's victory in the U.S. presidential election; pp 1, 9 (1,000 words). 6. Anna Polyukhovich report "Other Elections" looks at legalization of marijuana in some states in the U.S.A.; p 1 (150 words). 8. Ivan Afanasyev report "Obama's Headquarters Promise That Russian-U.S. Relations Will Not Change" looks at Barack Obama's victory in the U.S. presidential election; p 5 (700 words). 9. Igor Yavlyansky report "Agenda for 4 Years" looks at Obama as Russia's partner for the next four years; p 5 (750 words). 10. Vladimir Dergachev report "Alexander Brod Asks President to Dismiss Mikhail Fedotov as Head of Human Rights Council" looks at the conflict between human rights activist Alexander Brod and head of the presidential human rights council Mikhail Fedotov; p 7 (600 words). 11. Kirill Nikitin report "Devaluation of Dream" looks at the economic situation in the U.S.A.; p 9 (700 words). 12. Yelena Rykovtseva report "Exposed America" looks at Central Elections Commission head Vladimir Churov's criticism of the U.S. presidential election; p 9 (700 words). 1. Viktoria Prikhodko article headlined "Dmitry Medvedev Comments on Serdyukov's Resignation" features Medvedev's comments on Defense Minister Anatoly Serdyukov's dismissal and Sergei Shoigu's appointment to the post; pp 1-2 (650 words). 2. Alexander Minkin article headlined "For Beautiful Eyes," written as a letter to Putin, comments on Serdyukov's dismissal as defense minister and says that he would have never become defense minister if it were not for Putin, so Putin is responsible for the state of affairs in the Russian army; pp 1, 3 (600 words). 3. Melor Sturua article headlined "'4 More Years'" looks at the U.S. presidential election, the presidential nominees' speeches after the election results were announced and compares Barack Obama's speech to that made by Putin after his election as president in May; pp 1, 9 (700 words). 4. Anastasia Rodionova article headlined "Razvozzhayev: 'They Promised to Kill My Children'" says that the Moscow City Court has left opposition activist Leonid Razvozzhayev under arrest. He fears for his family members; p 2 (600 words). 5. Alexander Melman article headlined "Let's Get Back to the Subject!" ridicules the way in which Russian TV channels covered Anatoly Serdyukov's dismissal as defense minister; p 2 (600 words). 6. Olga Bozhyeva interview with former Deputy Defense Minister Anatoly Sitnov (1994-2000), headlined "'Main Problem Is Disorder in Managing Armed Forces,'" who speaks about challenges that the new defense minister will face; p 3 (600 words). 7. Stanislav Belkovsky article headlined "Putin and 1937" comments on Serdyukov's dismissal as defense minister and Shoigu's appointment to the post; p 3 (900 words). 8. Ignat Kalinin article headlined "Oboronservis to Be Shot From All Calibers" looks at the latest developments in the Defense Ministry's Oboronservis case; p 3 (400 words). 9. Alexei Mukhin article headlined "Putin 3.0" contemplates Putin's staff policy; p 4 (650 words). 10. Yevgeny Krasnikov article headlined "U.S.A. and Russia: What Next?" features comment by political expert Nikolai Zlobin on prospects for development of Russian-U.S. relations after Barack Obama stayed in office; p 9 (200 words). 11. Renat Abdullin interview with Andrei Vinogradov, head of the Political Studies and Forecasts Centre at the Far East Institute of the Russian Academy of Sciences, headlined "Chinese Also Choose," who speaks about the political struggle in China; p 10 (450 words). 1. Mikhail Barshchevsky interview with State Duma Deputy Olga Timofeyeva, headlined "Private Viewing," who speaks about the work of the new State Duma Committee on Information Policy, Information Technologies and Communication; p 8 (1,197 words). 1. Inga Vorobyeva article headlined "'Hot Dish' for Putin" looks ahead at Putin's meeting with his Israeli counterpart today in Moscow; p 2 (300 words). 2. Alexander Litoi article headlined "About Tortures to UN" says that human rights activists will submit to the UN a report on tortures in Russia. They demand introducing an article on tortures to the Russian Criminal Code, under which state officials will be punished for creating unbearable conditions for people dependent on them; pp 1-2 (800 words). 3. Anastasia Novikova and Ivan Petrov article headlined "Law for Officials" says that the State Duma has decided to amend a bill envisaging measures to make military service more attractive and prestigious, which bans people who evade military service from occupying official's posts. Lamakers want the bill to be also applied to deserters and malingerers; p 2 (300 words). 4. Yulia Kalachikhina article headlined "For Obama and Marijuana" looks at the U.S. presidential election and how markets reacted to Barack Obama's victory; pp 1, 4 (650 words). 5. Unattributed brief interview with Derk Sauer, newly appointed president and chairman of the board of directors of the Russian media group RBK, headlined "'All Employees Should Understand Company's Global Mission,'" who speaks about his appointment and shares his views on the development of RBK; p 9 (500 words). 1. Vladimir Sanin article headlined "Most Difficult Fire in Sergei Shoigu's Life" comments on the scandal around the Defense Ministry and the reshuffle of the ministry's head and looks at tasks set before the new defense minister; p 2 (480 words). 1. Alexander Yunashev article headlined "Get Out With Your Luggage" says that dismissed Defense Minister Anatoly Serdyukov has been given one month to return his service flat and car; p 2 (300 words).